Two journalists, guesting on Jordan’s 7 Stars network, got into such a heated debate over the Syrian crisis that they took it out on the set. What started as a verbal debate between Shaker Al-Johari and Mohammed Al-Jayousi quickly turned into a physical altercation, with the two men grabbing the top of the desk and lifting it up while tugging on it in opposite directions. The front of the desk fell off, sending scripts flying to the ground. The two continued to yank at the tabletop, now completely separated from the base, while getting perilously close to knocking over what appear to be very flimsy set walls — all this while the host pleaded for the two to stop while getting hit several times by the desk piece. 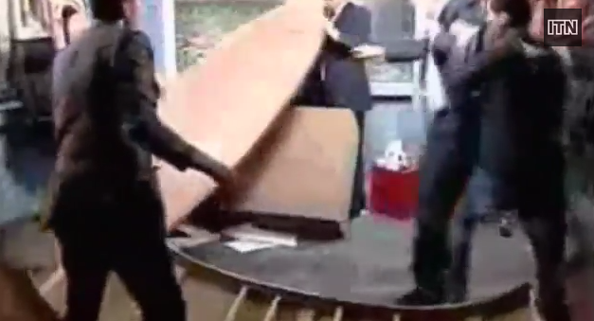 Eventually two men enter from off camera and break the fighting pair up, who drop the desk top.